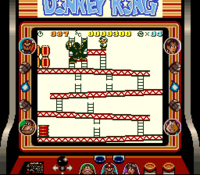 25m (or 25 m) is the first level of the Donkey Kong arcade game and Donkey Kong on the Game Boy. It is the bottom level of the Construction Site in the latter game. The level starts with Donkey Kong capturing Pauline, Mario's girlfriend. The player takes control of Mario as he jumps over barrels and climbs to the top of 25m, where Donkey Kong and Pauline are located, via a series of ladders. Mario also finds hammers around the area, which he uses to smash the barrels. After reaching the top of 25m, Donkey Kong grabs Pauline and climbs up to 50m. The bottom of the level also features an Oil Drum. If a blue barrel enters the oil drum, it creates a Fire that tries to hunt down Mario. If there are five Fires simultaneously onscreen, Donkey Kong stops throwing blue barrels, and any remaining blue barrels do not create a Fire unless Mario thins their number. 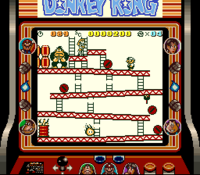 In the original arcade game, an intro segment shows Donkey Kong climbing to the top of the Construction Site with Pauline under his arm, then jumping along the top platform to cause the broken ladders and sloped girders that make up the level. It was cut, along with most of the cutscenes and the 50m level, in the Nintendo Entertainment System versions, but was eventually restored in the Game Boy version. In the Game Boy version, two layers of platforms are removed due to the handheld's small screen. A later level, Stage 9-5 in the Tower, retains the exact appearance of the original 25m by employing a scrolling screen. Fire Depends on how many blue barrels reach the oil barrel. On 75 m in Super Smash Bros. Brawl, Super Smash Bros. for Wii U and Super Smash Bros. Ultimate, this level's theme is one of the available songs. The theme is also heard in some fashion within all of the other Donkey Kong tracks available in Super Smash Bros. Brawl, as well as in the Donkey Kong and Donkey Kong Jr. medley in Super Smash Bros. Ultimate. This stage appears in the background near the start of Foggy Fumes in Donkey Kong Country Returns and its remake. In Nintendo Land, the end of the first level in Donkey Kong's Crash Course resembles 25m. In NES Remix, Link must play this level in one of the many challenges. A hand-drawn version of 25m appears in the PictoChat 2 stage in Super Smash Bros. for Nintendo 3DS as one of its drawings. The barrels Donkey Kong throws here can damage fighters. In Super Mario Odyssey, the song "Jump Up, Super Star!" contains the musical theme for 25m during the point where "Odyssey, ya see" is repeated by the vocals. The bassist in New Donk City also can be heard playing the music when Mario first finds him. It can also be heard in the variation of "Break Free (Lead the Way)" heard during the ending cutscene. In the Mario + Rabbids Kingdom Battle DLC, Donkey Kong Adventure, at one point, one Rabbid throws barrels at another one in a wooden structure resembling this stage, and Beep-O's comment references the stage's name. This is the only level in the game without Pauline's lost items.